How much did we have today! My after school class celebrated pumpkin day for our harvest of the month festival. We used some great resources from Mrs. Ricci's Kindergarten! 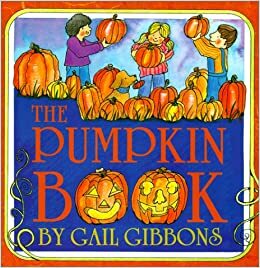 We also read The Pumpkin Book by Gail Gibbons. after doing a sequence activity and singing a song. Love this video! Now, after reading the book and singing a song and even doing our sequence activity, we watched this great time lapsed video to watch the sequence in action. We used this sheet for a cute book. Here is my little cousin in our after school class. You go Alli. Pumpkin Day rocks! Do pumpkins float or sink? Our little kiddos predicted, all said sink. We started with a small pumpkin...it floated. We put a medium pumpkin in the sink, it floated. Then, we put the big pumpkin in the sink, it overflowed and floated! The kids were amazed. We discussed why they float. We then cup open one of our pumpkins and it was HOLLOW! They got it! Hi! I love your blog & I'm your newest follower! It's so nice to find another elementary school science teacher - there's not many of us out there! Thanks for stopping by my blog!